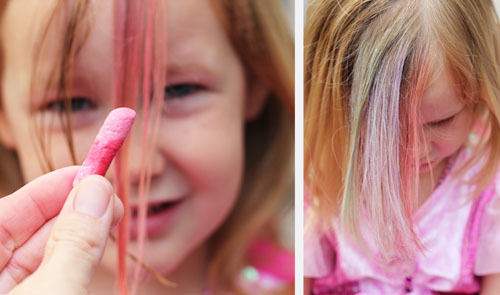 Summer Fun: Coloring Hair…with Chalk! Two weeks ago, ONE invited us to join them at the Elizabeth Glaser Pediatric AIDS Foundation’s annual event “A Time for Heroes” in Los Angeles. Our family had a wonderful time enjoying the carnival, seeing the sights and celebs (Richard Simmons called Nate his son and Owen his grandson, and Owen is best buds with Gwen Stefani’s dog…in fact, the dog kissed Owen AND Nate, which basically means they both kissed Gwen, right? ), and spending time with some amazing people, like Marcus Samuelsson’s wife Maya. Anna was especially delighted that there was face painting and a table where they COLORED YOUR HAIR. Anna is kind of obsessed with anything that involves decorating her body (face paint, hair styling, jewelry, flashy clothes, tattoos…we’re kind of scared). So, anyway, I wanted to share the hair coloring trick with you because it was so simple and genius! I know, none of this has anything to do with food, but I’m pretty sure some of you reading this blog have kids and a long summer stretching before you. This is definitely a fun activity and I love how UN-permanent the color is. Plus, the color ends up looking really pretty and subtle. 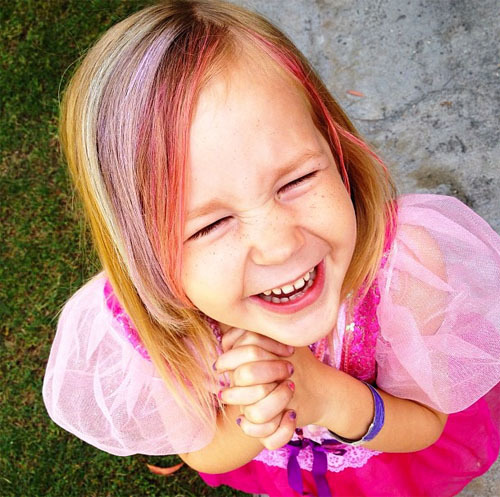 Win-win for parents and kids…crazy colored hair that’s actually not that crazy and washes out easily! Wet a small portion of hair, from the root to the ends. 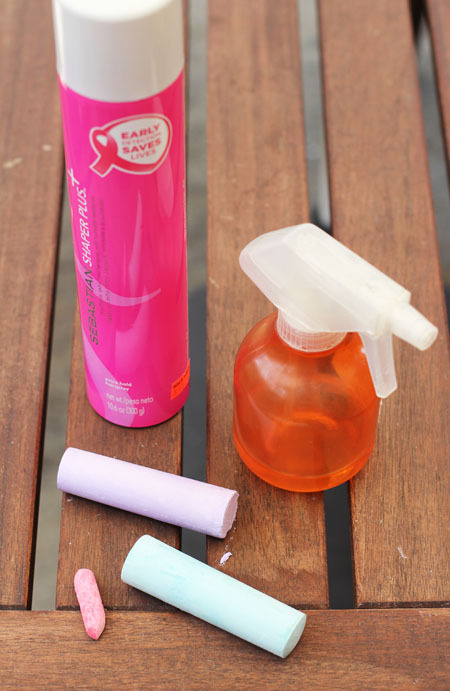 You can spray the hair with spray bottle or use a very wet towel or papertowel. The lady at the party used a papertowel. I used a spray bottle, which was decidedly less pleasant for the hair coloree, but she was my kid, so I wasn’t too worried about it. 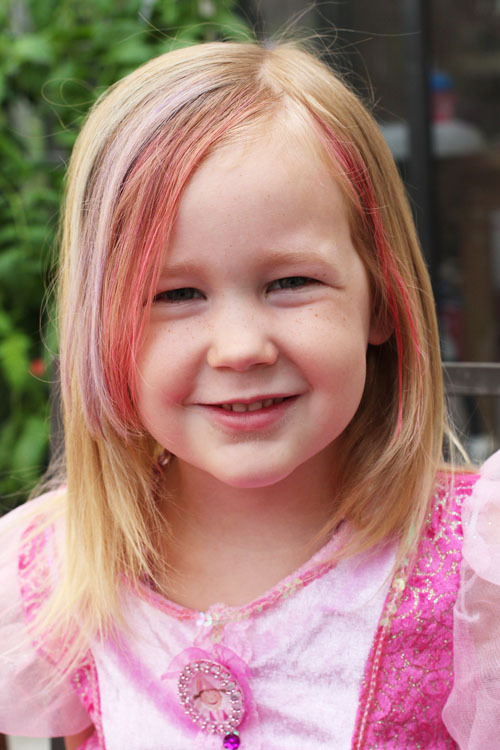 Slide the chalk up and down the piece of hair, applying moderate pressure, until hair is sufficiently colored. The smaller the piece of hair, the easier it is to apply the color. Work in small sections! Spray lightly with hair spray to set the color, then smooth out gently with a comb and/or fingers. This was the Instagram shot I took of her right when we finished. It was too cute, had to add it in! What a great idea! I’m totally doing this. Thanks! So cute – I love the last pic! I’ve seen this on Pinterest before, but haven’t had the opportunity to try it yet. This is too fun! 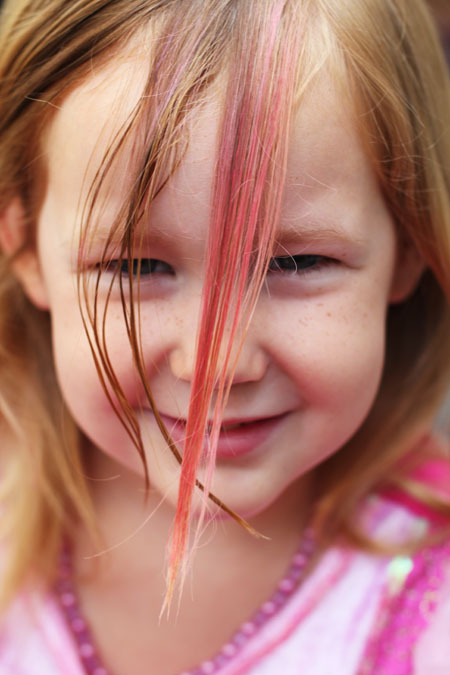 I wonder if Caleb will mind if I make him have pink hair..ha! Pfft, for kids–I’m 35, saw this on the Today Show a couple weeks ago and wanted to do it myself!! This is going to be so much fun when the grandbabies come and we can see how many different colors their hair can be. Jane! I LOVE this idea! I also love how supremely happy Anna seems with anything pink, purple, sparkly, and fancy. All girl that one! 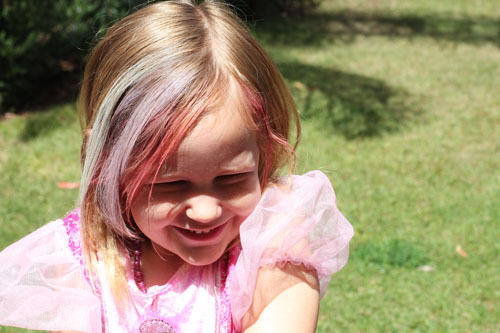 I told my niece about how we can highlight our hair with chalk the next time we spend time together. She can’t wait! I’m guessing she will go for neon orange or green…….. This would make my daughters day instantly!! !